In Summer 1644 the Earl of Essex attempted to dislodge the Royalists from the South West but was encircled and brought to battle at Lostwithiel. Fought in and around the ancient fort at Castle Dore the victory of the King’s forces did, for a while, seemingly mitigate against the catastrophic loss of northern England earlier that year. In early 1644 Lyme (now Lyme Regis) was acting as a base for Parliamentary operations against the Royalists in the South West. The area was predominantly under Royalist control and was key to their war effort with the tin and copper trades helping to fund the King's cause. Accordingly Lyme was perceived as a threat and Prince Maurice was instructed to besiege it which he duly did in April 1644. The town however proved surprisingly resilient to his efforts - he was still there in mid-June. Concurrently Parliament was trialling a new strategy. Previously they had three separate armies in the field in southern and central England. The primary force was under Robert Devereux, Earl of Essex but two other armies - the Eastern Association under Edward Montagu, Earl of Manchester and a further army under Sir William Waller - were engaged in operations in Lincolnshire and Hampshire respectively. 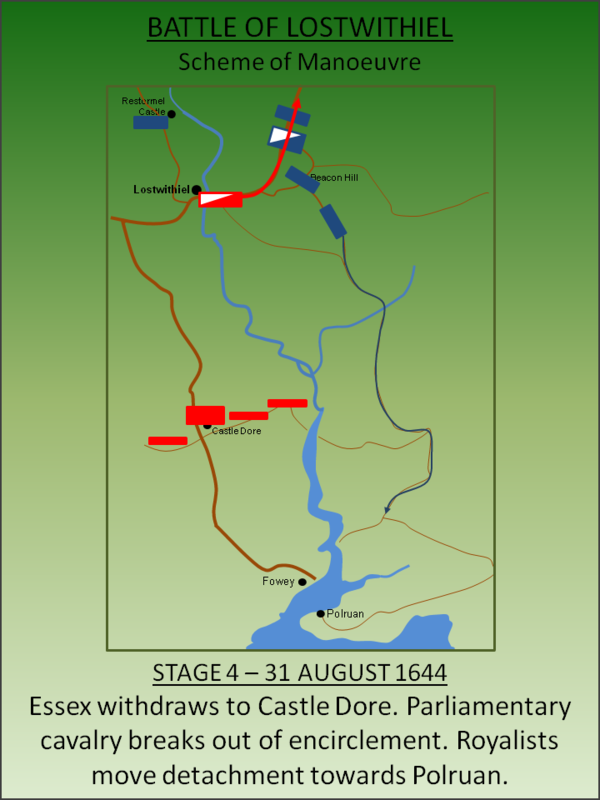 Whilst Manchester couldn't be released from Lincolnshire, the forces of Essex and Waller were combined and tasked against the garrisons surrounding Oxford. This initially met with success with the King being obliged to withdraw his forces from both Reading and Abingdon in light of the new threat. But relations between the commanders in the combined army were poor and when Waller pursued the King towards Worcester, Essex did not follow. Instead, on 6 June 1644, he abandoned his Oxford campaign and deployed to the South West to relieve Lyme. 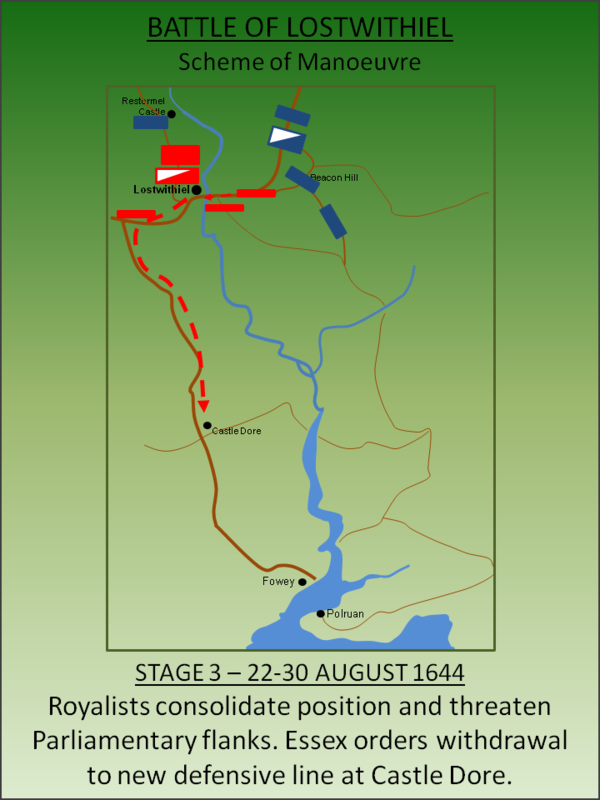 Essex made fast progress and by 15 June 1644 he was at Blandford prompting Prince Maurice to lift the siege around Lyme and withdraw to Exeter. Essex followed forcing Maurice to retreat further west. Maurice hoped Essex would pause his advance and besiege Exeter but instead the Parliamentary force continued in pursuit by-passing the town. The Royalist cause in the south west was now in chaos as Essex's advance forced the local Royalist Commander, Sir Richard Grenville, to abandon his siege of Plymouth, the only other significant Parliamentary garrison in the South West. Essex now hoped that with support from the Plymouth garrison and local recruits, he could wrest control of the South West from Royalist control and cut off the supplies of Cornish tin that financed their war machine. Essex entered Cornwall on 26 July arriving in Bodmin a few days later. But his plan was already unravelling; Cornwall failed to show much enthusiasm for Parliament whilst a significant Royalist force, having defeated Waller at the Battle of Cropredy Bridge, had already deployed from Evesham to augment Prince Maurice’s force headed by Charles I himself. The King and his army arrived in Exeter on the 26 July trapping the Parliamentary force. 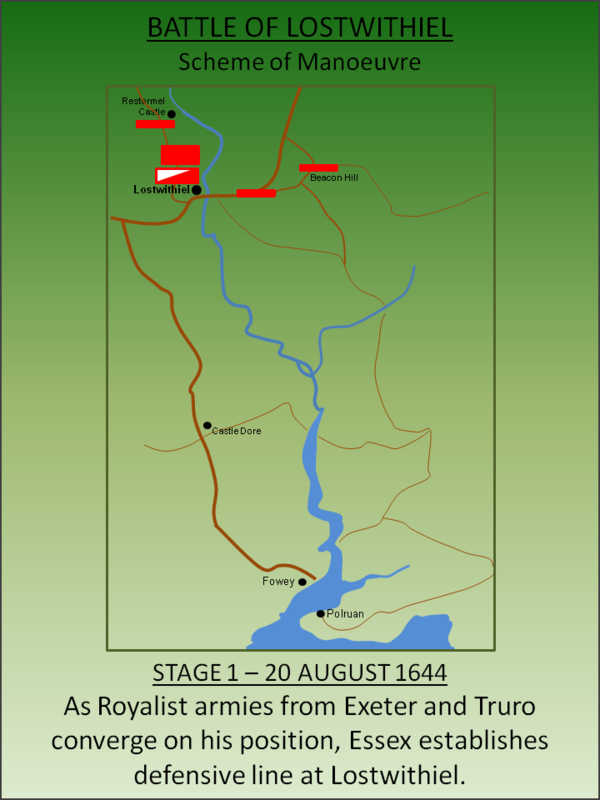 The King continued to press west and on the 11 August a rear-guard of Parliamentary cavalry was dislodged from Bodmin unifying the Royalist forces of the King/Prince Maurice and the Cornish forces of Sir Richard Grenville. Now facing a combined Royalist army, Essex was in an unenviable position. He was cut off from other Parliamentary forces with a significantly larger Royalist force blocking his retreat east. He was now entirely reliant on resupply and evacuation by sea. Whilst this was a realistic prospect – Parliament had control of the Navy – it required a port to embark from. Accordingly Essex moved south to Lostwithiel aiming to secure an evacuation route via Fowey. 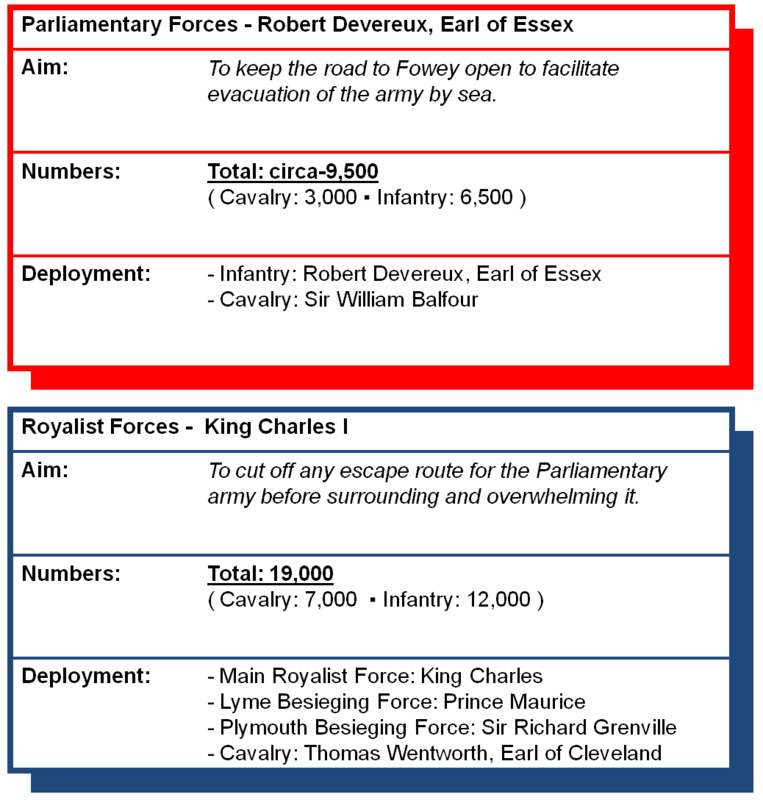 Essex had a force of around 10,000 but surrounding him were Royalist forces almost twice the size. 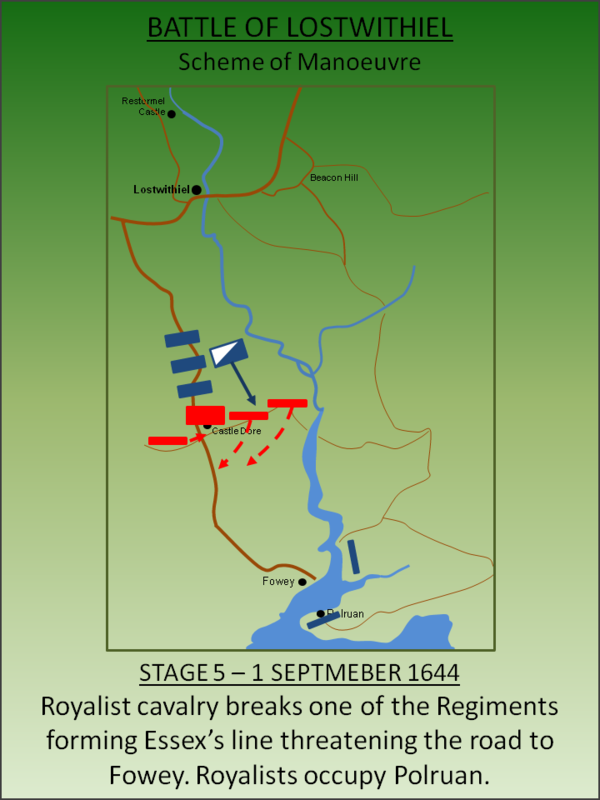 The battle was fought over a 13 day period between 20 August and the 2 September 1644. Significantly outnumbered Essex sought disengagement but desperately needed to keep the Fowey road open in order to ensure he could withdraw. Accordingly he deployed his forces in a defensive line between Restormel Castle in the west and Beacon Hill in the east. 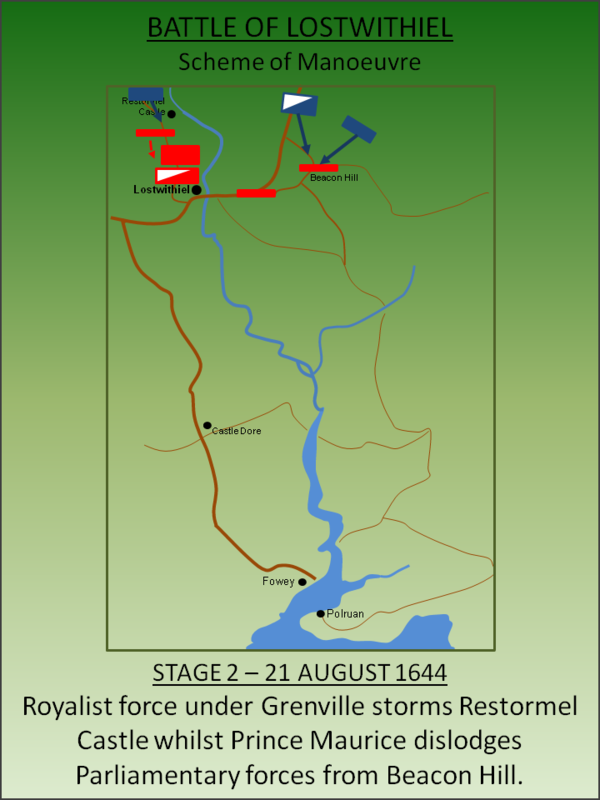 On 21 August, the Royalists commenced a co-ordinated attack intended to break Essex’s line. Grenville stormed Restormel Castle dislodging Essex’s left flank. Concurrently Prince Maurice struck at Beacon Hill driving the Parliamentarians out. With his flanking forces broken, time was running out for Essex. The Royalists continued to consolidate their positions and it increasingly became clear Lostwithiel was no longer tenable. As Royalist forces started to threat encirclement of his forces, Essex withdrew his army south towards Fowey. Essex's infantry established a new defensive line centred on the ancient hill fort at Castle Dore. As the cavalry couldn’t hope for withdrawal by sea, Essex ordered them to breakout out along the road to Plymouth. Blocking the way were the forces of Prince Maurice but the Royalists were spread thin both maintaining the cordon and foraging for food/supplies. The escaping cavalry broke through and arrived in Plymouth more or less intact. Concurrently the Royalists were continuing their efforts to prevent the Parliamentarians retreating by sea and were advancing forces to the east of the River Fowey towards Polruan, directly opposite Fowey. On the 1 September Essex's line at Castle Dore broke. One of the flanking regiments fled the field whilst the other returned to the main army body at Castle Dore. The Royalists were now able to flank around Essex’s forces and threaten his route to Fowey. But this had now become irrelevant – Parliament had failed to get any ships into Fowey and the Royalists had captured Polruan directly adjacent to the port - no evacuation would now be possible. Wishing to avoid arrest and imprisonment Essex abandoned his army and escaped via fishing boat to Plymouth. The Parliament infantry, left under the command of Sir Philip Skippon, surrendered on 2 September 1644. They were disarmed, giving the Royalists a significant windfall in arms and ammunition, and allowed to march free on the proviso they took no further part in hostilities until they reached Southampton. 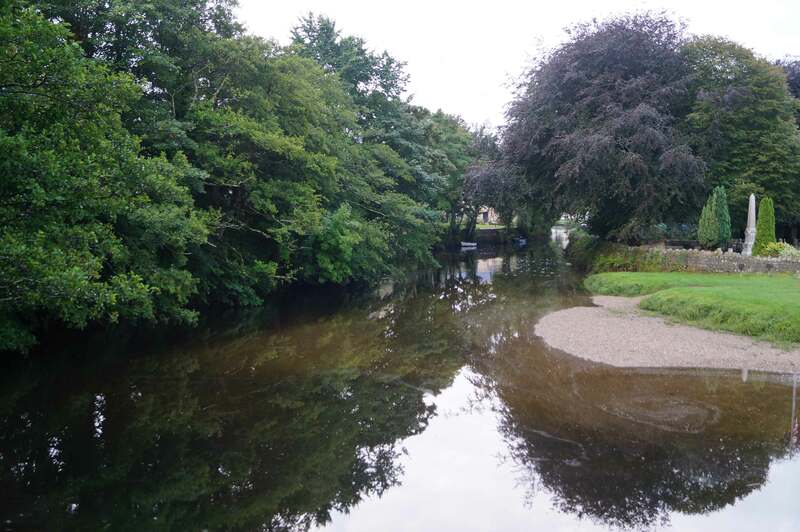 Many didn’t make it – some were attacked by the angry residents of Lostwithiel as they crossed the bridge over the River Fowey whilst for others the weeks of living in difficult field conditions prompted wide scale desertion. Nevertheless a significant portion did survive and were fighting Royalist forces a couple of months later. Ultimately the battle was a victory for the Royalists and one of the biggest defeats inflicted upon Parliamentary forces during the war; it secured the South West for the King until the final days of the war. For a time it also seemed to mitigate against the crushing defeat suffered by Charles I at the Battle of Marston Moor in July. However the Royalist victory was less comprehensive than it appeared; the Parliamentary cavalry remained intact and armed whilst the 6,000 strong infantry were allowed to march free with minimal parole conditions. Many of these men would go on to form the backbone of the New Model Army that would win so decisively at the Battle of Naseby the following year. Ede-Borrett, S (2004). 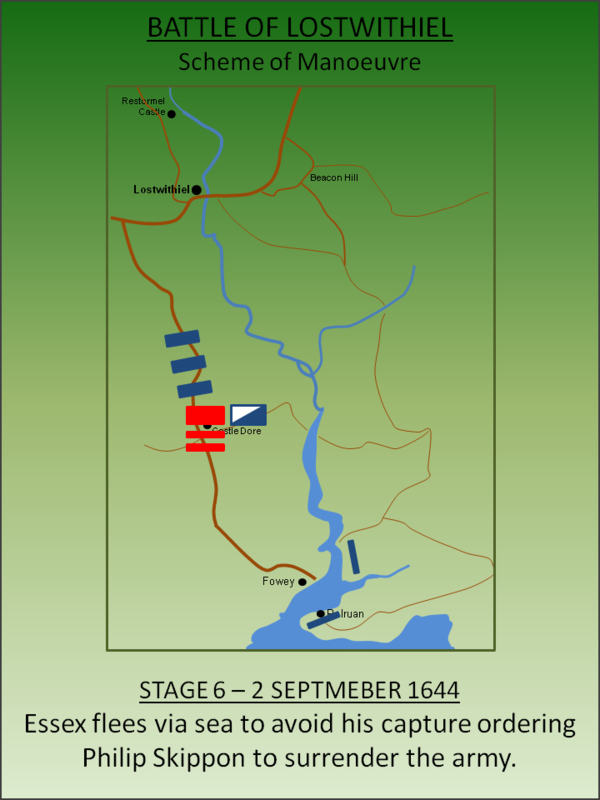 Lostwithiel 1644: The Campaign and the Battles. London. Lancaster, J.H.D (2014). Lostwithiel: Battlefield visit notes and observations. CastlesFortsBattles.co.uk. Newman, P (1985). Atlas of the English Civil War. London. Ordnance Survey, 2016. Cornwall. 1:2500. Southampton. Ordnance Survey, 2016. Fowey. 1:1250. Southampton. Ordnance Survey, 2016. Lostwithiel. 1:1250. Southampton. Ordnance Survey, 2016. Polruan. 1:1250. Southampton. There is no battlefield monument but the relevant areas can be easily visited. 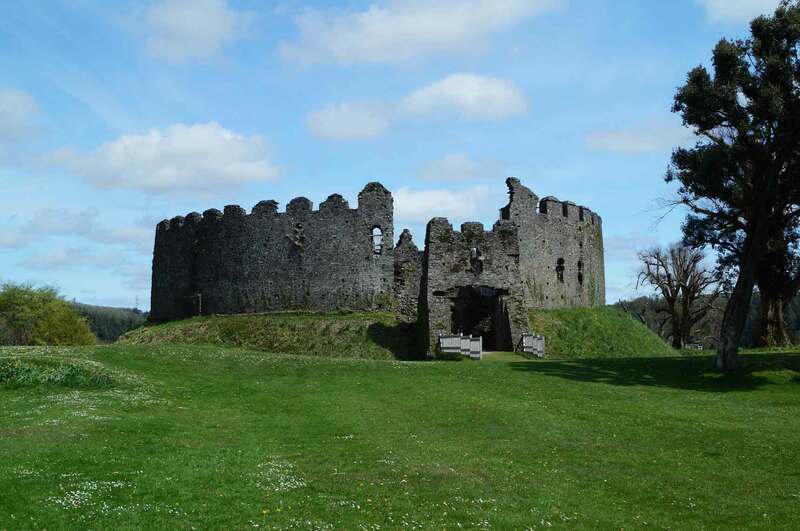 Restormel Castle is a major tourist attraction and should form part of any visit to the location. 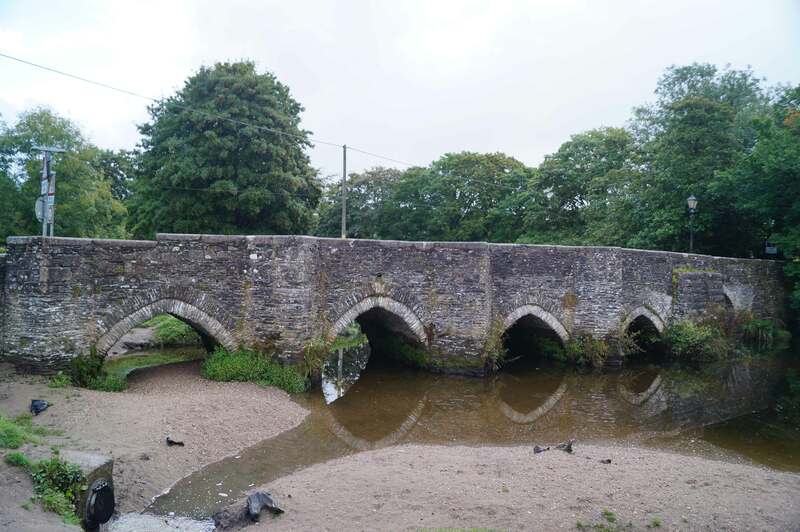 The bridge at Lostwithiel (where the citizens attacked the disarmed Parliamentarians following their surrender) can be viewed along with St Batholomew’s Church (used as stables). 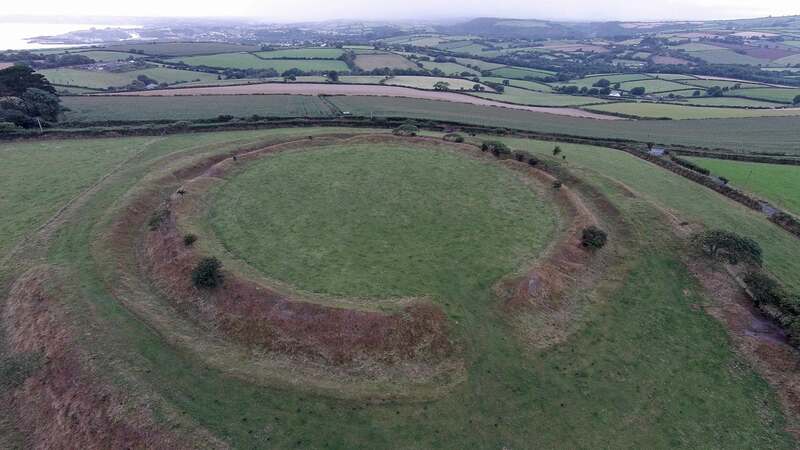 The ancient earthworks of Castle Dore, which was the centre of Essex’s line once Lostwithiel became untenable, are also accessible. Numerous sites of interest are also visible in Fowey and Polruan - the latter of which was occupied by the Royalists to prevent Parliamentary naval access. Restormel Castle. Essex initially established a defensive line between Restormel Castle in the west and Beacon Hill in the east. Both were stormed by Royalists on 21 August 1644. St Bartholomew’s Church. Essex’s Parliamentary forces didn’t endear themselves to the Lostwithiel populace when the local church was utilised as a stables. Allegedly one of the horses was called Charles. Beacon Hill. The initial right flank of the Parliamentary position was dislodged by an attack by Prince Maurice. Castle Dore. Castle Dore was constructed no later than the fourth century BC as a defended settlement. The earthworks were occupied by the Parliamentarians as they established a new defensive line after being ejected from Lostwithiel. 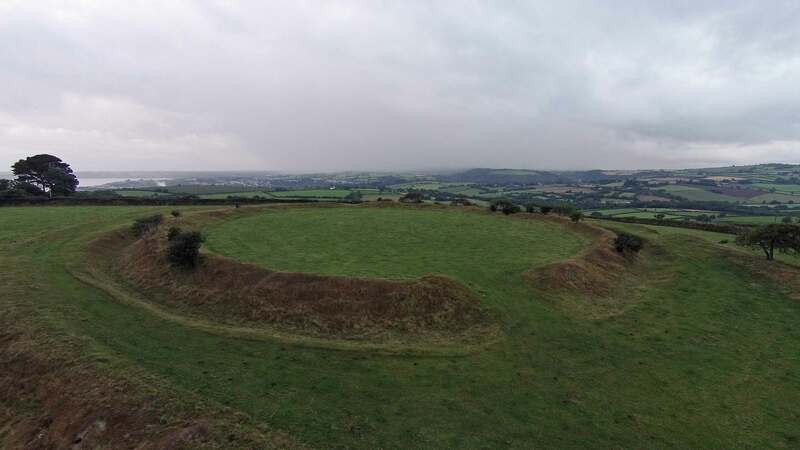 The earthworks at Castle Dore. The terrain around Castle Dore - scene of the second stage of fighting. Lostwithiel Bridge. The bridge over the the River Fowey was a chokepoint over which the surrendered Parliamentary forces had to cross on their march towards Southampton. The Lostwithiel population attacked them here. Fowey Harbour (from Polruan). Once the Royalists had occupied Polruan, use of the port by the British Navy became impossible. 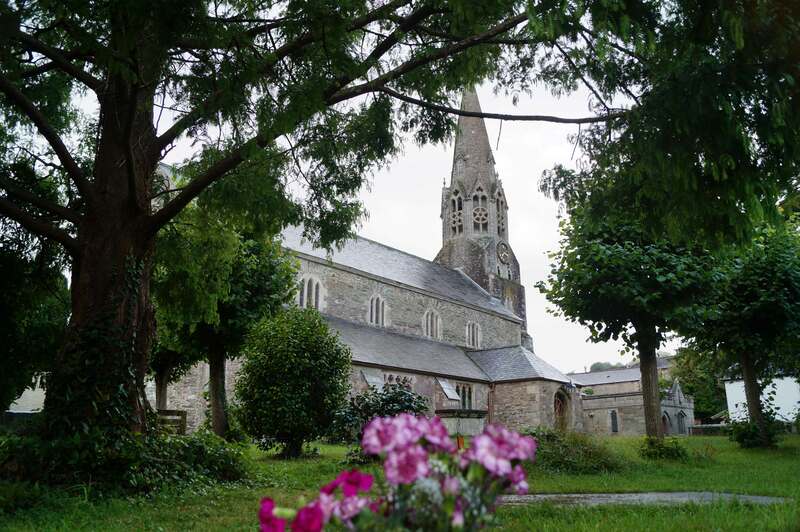 Lostwithiel is well sign-posted and has a central car park for visitors just a short walk away from the bridge and church. Castle Dore is in a rural area accessed via a gate directly off the B3269. A small lay-by suitable for one car is about 150 metres south of the gate. Extreme care should be taken when walking on the national speed limit road.